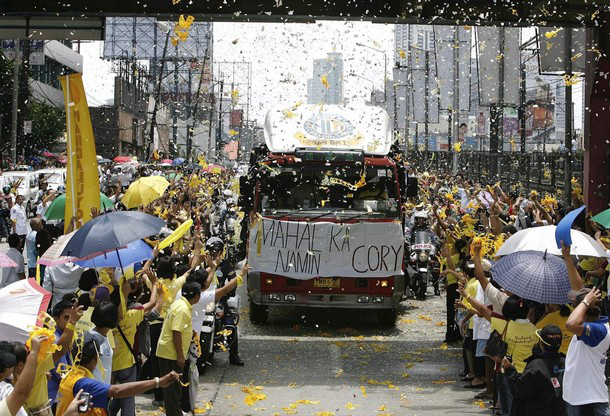 Casket of late former President Corazon Aquino passes by EDSA on August 3, 2009 (Credit: militaryphotos.net). On August 1, 2009, Ma. Corazon Sumulong Cojuangco Aquino, the first woman President of the Philippines, died of colon cancer at the age of 76. Born in Manila, "Tita Cory," as she was fondly called, was the mother of the country's 15th and current President, Benigno Simeon "Noynoy" Aquino III. She is best remembered for leading the 1986 EDSA People Power Revolution which toppled the authoritarian regime of President Ferdinand Marcos and restored democracy in the Philippines. Notably, she was revered by many Filipinos as the Philippines' "Icon of Democracy". She was also hailed by TIME Magazine as the "Saint of Democracy", due to her well-known spiritual life and strong adherence to non-violence and democracy. Prior to her post as president, Cory was known as the self-proclaimed "plain housewife" of the Senator Benigno S. Aquino Jr., the popular opposition leader and staunchest critic of the Marcos administration, who was assassinated on August 21, 1983 upon returning to the Philippines after his three-year self-exile in the United States. This tragic event united the fragmented opposition leaders against the authoritarian Marcos regime, hence they called for widowed Cory to enter into the political arena against Marcos in the February 1986 snap election. After 20 years in Malacanang, Marcos was driven out from power and Cory was formally and peacefully sworn on February 25, 1986 as the new president, a historic event which is now known and remembered as the 1986 EDSA People Power Revolution. She finished her term in June 1992 and returned to private life, although she remained active in the public eye, constantly voicing her views and opinions on pressing political issues in the country.